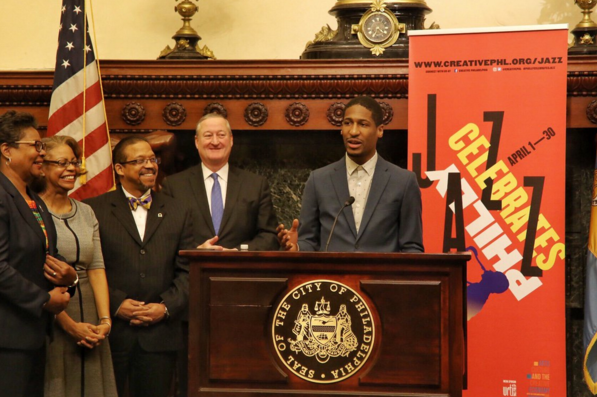 Jon Batiste accepts the Benny Golson Award at Philadelphia's City Hall on Monday, March 27. Music lovers will have plenty of opportunities to enjoy live performances next month as Philadelphia tunes up for a celebration of jazz. The Office of Arts, Culture and the Creative Economy has organized a series of concerts throughout Philadelphia as the annual Philly Celebrates Jazz event gets underway in April. On Monday, Mayor Jim Kenney kicked things off early by recognizing a jazz musician at a press conference at City Hall. Kenney presented Jon Batiste, a pianist and "Late Show with Stephen Colbert" bandleader, with the Benny Golson Award. The honor, dedicated after a native Philadelphian, is given to a jazz musician with an international reputation and a commitment to educating the next generation of performers. Local artists — guitarist Monnette Sudler-Honesty and organists Trudy Pitts and Shirley Scott — were also recognized for their contributions to jazz and the community. This year's celebration will feature more than 200 events, including exhibitions, film screenings and workshops. About a third of those events will offer free admission. "Philly Celebrates Jazz has provided us with the opportunity to launch this exciting series of high-quality and free arts and culture programming that we hope continues to grow throughout the year in every neighborhood in our city,” said Kelly Lee, the city's chief cultural officer. Appearances will be conducted at libraries, recreation centers and other public venues throughout the city. For the first time, the city will host free listening sessions on Wednesdays beginning at noon at the Art Gallery at City Hall, located in Room 116. Five world-renowned musicians — vocalist Jeannie Brooks, bassist Warren Oree and pianists Jim Holton, Eric Mintel and Orrin Evans — will sit down with an audience to discuss their careers and the art of jazz during an hourlong conversation.